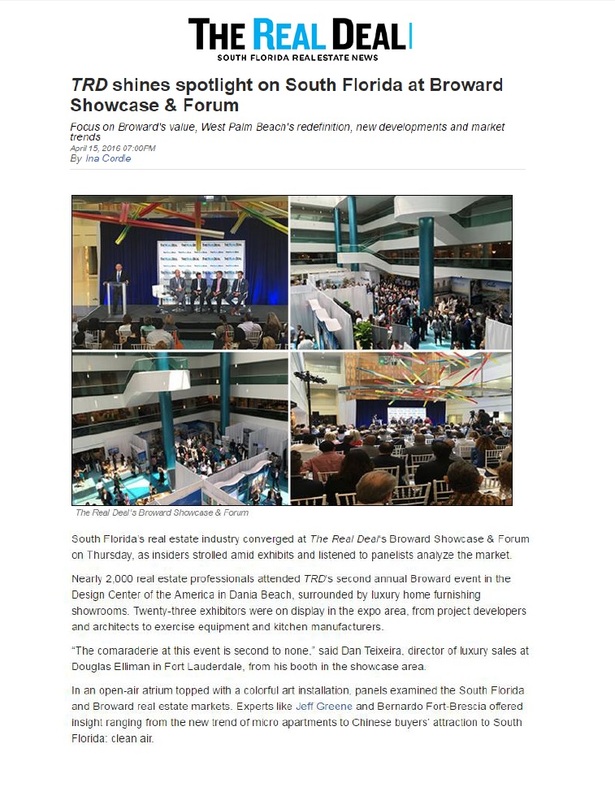 South Florida’s real estate industry converged at The Real Deal‘s Broward Showcase & Forum on Thursday, as insiders strolled amid exhibits and listened to panelists analyze the market. Nearly 2,000 real estate professionals attended TRD‘s second annual Broward event in the Design Center of the America in Dania Beach, surrounded by luxury home furnishing showrooms. Twenty-three exhibitors were on display in the expo area, from project developers and architects to exercise equipment and kitchen manufacturers. “The comaraderie at this event is second to none,” said Dan Teixeira, director of luxury sales at Douglas Elliman in Fort Lauderdale, from his booth in the showcase area. In an open-air atrium topped with a colorful art installation, panels examined the South Florida and Broward real estate markets. Experts like Jeff Greene and Bernardo Fort-Brescia offered insight ranging from the new trend of micro apartments to Chinese buyers’ attraction to South Florida: clean air. In fact, of 417 new condo projects with 51,000 residential units in the pipeline east of I-95, 19 percent are in Broward, said Peter Zalewski, a TRD columnist and founder of research firm CraneSpotters.com, who moderated the panel. And unlike new developments in Miami-Dade, panelists said they have discovered that Broward projects tend to attract primarily domestic buyers. Yet some of Related’s uncertainty lingers. The company is still trying to determine whether its Icon Las Olas development should be rentals or condos, Campbell said. “We want to let the market decide,” he said. Currently, many Broward condo projects are attracting empty nesters from the western suburbs who are looking to downsize, panelists said. Jean Francois Roy, founder of Ocean Land Investments, which is developing several projects in Broward, was drawn to the county after the last recession due to value. “We decided to develop projects for the baby boomers,” he said. Ninety-five percent of his buyers are from Broward County. Demand for office space is also driving new development. In western Broward, the office and retail markets are “very strong,” amid a residential slowdown, said Joseph Kavana, speaking on the panel “South Florida Development Outlook.” His firm K Group Holdings is developing Metropica, a $1.5 billion, 65-acre master-planned community in Sunrise that will have four million square feet when it’s completed. Further north, in West Palm Beach, Greene is in the midst of a development boom all his own. His plans include One West Palm, designed by Arquitectonica, which will bring 340,000 square feet of Class A office space. “If a Class A tenant wants to come to West Palm Beach today, it’s just not possible,” Greene said. Greene is also proposing micro apartments, which panelist Fort-Brescia, founding principal of Arquitectonica, likened to the tight spaces of a yacht, where every inch counts. Current trends, he said, in addition to micro units, are flex space in office space, and food and beverage on the retail side. Fort-Brescia sees West Palm Beach in the midst of a “redefinition” from its roots as a resort. “I think the projects and the micro units are an integral part of making West Palm Beach a real city,” he said. Among his projects, he is designing buildings for China City Construction in Miami Beach and on Brickell, and he views increasing interest in Florida from China in part because of the value the Chinese place on clean air. While panelists acknowledged that the market has slowed in recent months, Beth Butler, president of Compass Florida, said March showed improvement, and there’s much less supply than what’s widely reported. In Miami-Dade, she said new construction on the market is anywhere from 3,000 to 5,000 units. “We don’t have this tremendous supply in the market,” she said. Fernando de Nuñez y Lugones, executive vice president of ONE Sotheby’s International Realty’s luxury condo development division, has witnessed the market dive. “This was the worst season ever for us,” he said, and he expects the condo market to flatten in 2016 and 2017. In the future, buyers can expect to see more condo projects with retail at ground level, and the growing emergence of hip areas like Flagler Village in Fort Lauderdale — along the lines of Miami’s Wynwood neighborhood. Commercial prices in Fort Lauderdale and especially in Flagler Village are poised to rise as new commuting options emerge for residents, said Jaime Sturgis, sales director for Metro 1’s Broward office.